Are you looking to replace windows in your existing home, or choose windows for your new building? If you’ve done some research, you’ll know that it can be tough wading through all the information out there. Window replacements can be a costly investment. Picking a company that offers you a range of styles and functions, while ensuring you get a good quality product installed, is daunting! So do Sunrise Windows measure up? Sunrise Windows is a Michigan-based manufacturing company that sells windows and doors through various dealerships in 37 states, and parts of Canada. The company has been in operation since 1994, and offers 40 different window types with different functionalities. Unfortunately, the windows are not available from dealers on the west coast, or in many of the western states. Sunrise mostly manufactures vinyl replacement windows, but buyers have a choice of upgrades and custom features. You can select your preference from their range of casement, double hung, bay windows, bow windows, and more. Sunrise Windows are sold in five main product lines: Essentials, Standard, Verde, Vanguard and Restorations. Essentials is the entry-level window model and Sunrise is the standard, mid-range model. Vanguard and Restorations are more upmarket models. Buyers have the option of Solar Clean™ glass in the Vanguard and Restorations window models. This is an innovative self-cleaning glass with a durable, transparent layer of titanium dioxide on the outside surface. This layer reacts with sunlight to cause any organic matter on the windows to decompose and disappear. Very little window cleaning required – what a bonus! Sunrise windows have a high Energy Star rating, which means they are considered very energy-efficient. This applies only to the premium window models. The windows have a slimline construction that lets in plenty of natural light because of the smaller frame profile. 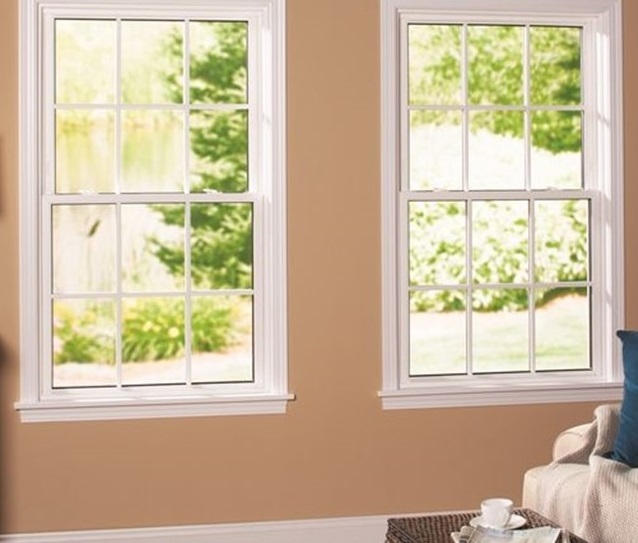 These windows are made with a standard, unfilled vinyl frame. They are the most inexpensive model and are available in a limited number of colors. They come in double hung, slider and picture window styles. Sunrise Essentials windows are OK for smaller openings, but you should probably consider upgrading to at least the standard Sunrise for larger window frames. The Standard Sunrise model is an upgrade from the Essentials model. It has a better quality extrusion, which means it blocks out noise and cold or hot air more effectively. 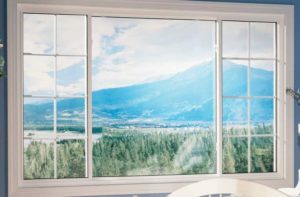 If you live in a noisy urban area, or somewhere that experiences big temperature fluctuations, these windows are a better option than the Essential model. They also come in a wider range of colors and glass options than the Essentials. The Verde window is similar to the Standard model, but it has a polyurethane-filled chamber in the extrusion, and polyurethane insulation around the window. Compared to the Essentials and Standard windows, this window offers more protection from outside noise, and the elements. The Vanguard is a high-security frame with a fiberglass core, polyurethane insulation, reinforced sash, and recessed pick-resistant lever lock. It’s a heavy-duty window that gives you peace of mind in high-crime or bad weather areas. Restorations is Sunrise’s premium and most costly window. It features a fiberglass-reinforced sash, polyurethane-filled chambers, and a high-transparency screen. This window gets its name because it’s designed to look like a wooden window, and is used in the restoration of older buildings. Depending on the size and type of window, Sunrise’s windows cost anywhere from $400 to around $800 per window, including installation. Here is a collection of prices that were quoted by various dealerships and contractors for Sunrise window installations. Sunrise offers a lifetime, non-prorated warranty that is transferable to a second property owner. Sunrise windows have mostly garnered good online reviews. Customers are generally happy with their reasonable prices, good quality, and special features. They have an A+ rating with the Better Business Bureau. The complaints they’ve received seem mostly focussed around inexpert installation, or having the wrong type of window put in – for example, one customer had Essential windows installed but was unhappy with the street noise. Another bad review we found was from a customer whose double-hung windows were installed incorrectly, so cold air could still get in through the sashes. The lesson seems to be that Sunrise windows are an excellent choice for replacement windows or a brand-new installation – if you pick your installer carefully!